The Lady Shockers golf team opens their fall season at the MSU/Payne Stewart Memorial at Twin Oaks Country Club in Springfield on Monday and Tuesday. Gone from the team after a stellar career is Taryn Torgerson the reigning AAC medalist and the Shocker career record holder for 18-holes with her 64 in the final round of last year's AAC Championship. In fact, the 4 lowest scores in Shocker history are 64, 67, 68 and 69 shot collectively 12 times half of which were by Taryn with the other half carded by 5 other Shockers. Taryn also is tied with Bryce Schroeder at 211 for the lowest 54 hole total However, that is Bryce's only score in the top 16 in Shocker history. Taryn owns 10 of the top 16 54-hole totals in Shocker history. Taryn is the Shocker record holder in single season and career stroke averages as well. Bottom line is the Shocks are replacing the best female golfer in school history by a significant margin. I think it is safe to say that the Shocks do not have any one player that will be able to replace Taryn. The only way they might come close to doing that as a team is for the entire team to step up their games. Not sure that is it the cards either.. This year's Shocker team is relatively small at 5-0, 5-1, 5-3, 5-4, 5-4 and 5-6. Based on last year's stats (18-hole stroke average) the Shocker's 2 seniors, 5-3 Laine Evans (75.87) and 5-0 Gavrilla Arya (76.67) should lead the way. With only 6 players on the roster 1 or both of the 2 freshman will need to step up. Gavrilla's younger sister,, 5-1 Chiarra Arya and 5-6 Hana Mirnik from Slovenia will probably both be in the mix this year. 5-4 juniors Michelle Ledermann (77.15) and Anna Chickering (78.95) round out the roster. BTW, Taryn's stroke average last year was 73.26.
goShockers.com reporting that Evan, G.Arya, Chickering, C. Arya and Mirnik will make up the team lineup in this tournament with Ledermann playing as an individual. To be honest my expectations are not very high this year. The key may be whether are not the two freshman can step in and be competitive and consistent from the get go. It has been rainy in Springfield as in Wichita lately but looks like today will be dry and Monday and Tuesday will be very pleasant. The field this will include 15 teams: Missouri State, UTEP, Creighton, Arkansas State, Omaha, Wichita State, Little Rock, Southern Illinois, UMKC, William Woods, Memphis, Murray State, Oklahoma City, Oral Roberts and Drury. Last year the Shockers finished 4th in this tournament 26 strokes behind winner Memphis among a similar field. So this will be a good measuring stick to see where the Shocks are relatively to this time last year. The Shocks finished 5th, 20 strokes behind 4th place Memphis, in last year's AAC Championship. Doesn't look like there is any live scoring available for this tournament. Last edited by 1972Shocker; September 9th, 2018, 12:37 PM. The Shocks finished in 4th place in Springfield 31 shots behind Memphis. This is a pretty similar finish to last year and I would consider this a decent start for this team. Michelle Ledermann competing as an individual shot a 222. Has Michelle been part of the team lineup the Shocks would have finished 3rd and improved by 11 strokes. While this is a decent start the team still seems to have the same challenges as last year which IMO was a lack of depth and consistency. We'll see how it goes. I had the privilege of meeting the womens golf coach. I was very impressed with him as a person. Very humble and a class act. He said the problem he is having to adjust to with being in a new conference is that the courses are longer. Going forward that will change how they have to recruit as far as getting kids that are longer drivers. I did mention that I invented the cross-over dribble back in the early 70"s but it didn't seem to be useful information for his program. Nice article on Shocker senior out of Maize South, Laine Evans. A tough day out in Idaho for the Lady Shocks. After the first 2 rounds of the Coeur D'Alene Collegiate they find themselves in 18th (dead last) at 40-over par. They were much better in Round 2 (14-over) than Round 1 (26-over). On the day the Shocks scorecards contained 4 triple bogeys and 2 quadruple bogeys. That can damage a scorecard in a hurry. Pretty good tournament for the Shocks to compare skills. Many competitive programs. Ladies playing much better today. If they can finish, moving up 3-5 spots is not out of the question. The ladies did play a little bit better today although they gave up a few storkes late. However, they were only able to move up 1 spot from 18th to 17th. There 12-over par effort today was the 7th best score in Round 3. The 2 seniors lead the way. Gavrilla had a very clean scorecard offsetting 1 bogey with 1 birdie and adding 16 pars for an even par 71 while Laine Evans chipped in with a 2-over 73. Michelle Ledermann contibuted a 75. Freshman Hanna Mirnik finished off the Round 3 scoring with an interesting 6-over 77. Hanna parred her first 7 holes, then went bogey, bogey, bogey, double-bogey over the next 4 holes before making 6 pars and 1 bogey over her final 7 holes. Anna Chickering had the throw away score with an 81. Unlike yesterday there was only 1 triple bogey on the teams scorecard today and that was by Anna which ended up not counting. Avoiding the big numbers certainly helped today. I think the challenges are pretty standard for this team. Developing consistency and depth. Last edited by 1972Shocker; September 25th, 2018, 06:44 PM. Round 1 at the Johnie Imes Invitational hosted by Missouri is in the books with the Lady Shocks sitting in 8th place in a feld of 13 teams at 10-over par. Missouri leads the field at 6-under. 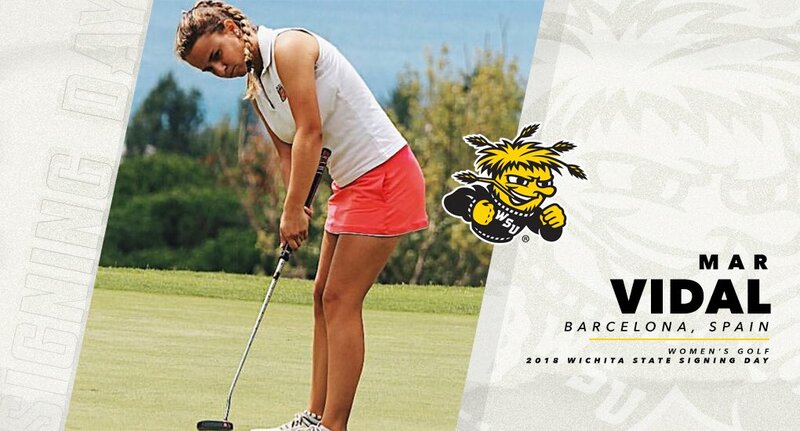 Hana Mirnik, the Shocker freshman from Slovenia, opened her round with a double bogey but finished off her round with a 3-over par 75 I think Hana will be a very good players for the Shocks over the next 4 years. Senior Gavrilla Arya continues to play well and lead the Shocks with an even par 72. Senior Laine Evans had only 2 pars in shooting 2-over on the front nine. After a bogey on #10 she strung 8 pars toghether and also shot a 3-over 75. Michelle Ledermann was pretty steady with 15 pars and finished with a 4-over 76. Freshman Chiara Arya had the throw away score at 6-over 78. Anna Chickering playing individually carded a 10-over 82. Round 2 tomorrow and Round 3 on Wednesday. The Shocks followed up their 10-over 298 in Round 1 with 7-over 295 in Round 2. Gavrilla Arya continues to play well shooting a 2-under 70 today which I believe is a new career low for her and puts her in a tie for 8th individually. Senior Laine Evans and Freshman Hana Mirnik both shot respectable 1-over par 73's today. Unfortnately, the remaining 2 team scores were Michelle Lederman at 7-over and Chiara Arya at 9-over. The Shocks are in 6th place but are 10 strokes behind 5th place Florida Internaional so are unlikely to move up in Round 3 tomorrow. 3 teams trail the Shocks by 5 strokes or less. Anna Chickering playing as an individual was 4-over today but she was 2-under after 9 holes. The 2 seniors, Gavrilla and Laine, plus the freshman from Slovenia, Mirnik, look to be pretty solid players. Unfortunately, not sure the Shocks have anyone else they can count on consistently. Perhaps one of the other 3 teams members will step up at some point this year but no evidence of that at this point. The Lady Shocks finished up at the Johnie Imes Invitational with their highest round of the tournament recording an 11-over 299 to go with 298 and 295 shot in Rounds 1 and 2. However, I would argue this was their best round of the tournament based on the scores of most ot the field today. The Shocks had the 3rd best score of the round behind only winner Mizzou (289) and Northern Illinois (298) who finished 4 shots behind the Shocks who finished 6th. Looks like either the conditions or pin placements toughened up the course some today as only NIU out of the 13 teams did not shoot their hightest score of the tournament. The Shocks gained ground on 4 of the 5 teams ahead of them. As I mentoned yesterday I didn't think the Shocks had a shot at a top 5 finish but they came close picking up 14 shots on Mercer who finished in 5th 3 shots ahead of the Shocks. Gavrilla Arya finished off with a 2-over 74 which put her at even par for the Tournament good for a 5th place finish on the medalist board. Laine Evans finished with a 75 and finished in a 4-way tie for 22nd individually. Michelle Ledermann shot a solid 2-over and Chiara Arya had her best round of the tournament at 4-over 76. Hana Mirnik fell of just a little bit with a 5-over 77. Last edited by 1972Shocker; October 3rd, 2018, 04:42 PM. The Lady Shocks had a nice trip to close out their fall season as the played in the Palmetto Invitational on the Turtle Point Golf Course at Kiawah Island, SC. The Shocks got off to a pretty slow start shooting 20-over par 308 on Sunday and found themselves in 13th place in the 18-team field 24 shots behind leader #35 College of Charleston. The Shocks recorded 3 scores of 4-over 76 and 2 scores of 8-over 80 in the 1st round with one of the 80's thrown out. The Shocks top 4 golfers, Laine Evans, Gavrilla Arya, Hana Mirnik and Michelle Ledermann bounced back with back-to-back solid rounds on Monday and Tuesday and the Shocks moved up 8 spots into a tie for 5th with #47 Charlotte. This group shot 70-74-76-75 = 295 on Monday and they inproved to 74-72-71-73 = 290 today. Anna Chickering had the thow away score in all 3 rounds at 80-82-79 = 25-over par. Based on this spring's results it looks like Laine, Gavrilla, Hana and Mirnik have the potential to be a solid group if they can be consistently good. What the Shocks do not appear to have is a good option as a backstop in the #5 position. So any poor rounds by the Top 4 will fully impact the Shocks scoring. Last edited by 1972Shocker; October 30th, 2018, 03:38 PM. With his top 2 golfers, Sr. Laine Evans and Sr. Gavrilla Arya, finishing up their eligibility this fall Coach Tom McCurdy announced the signing of three players to National Letters of Intent for the 2019-20 season. 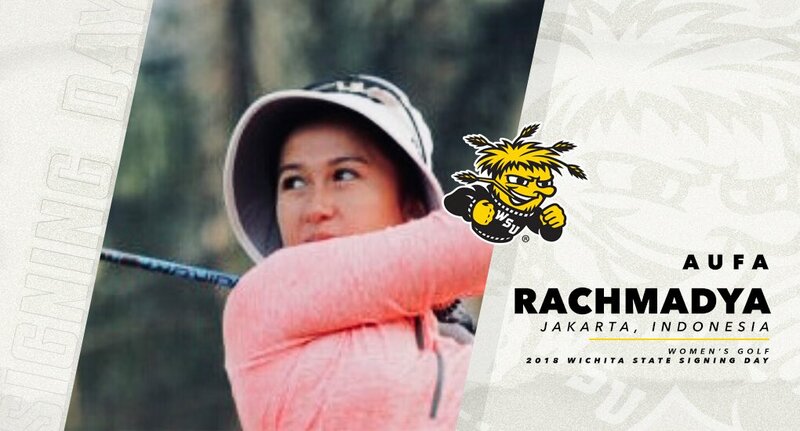 Sarah Lawson from Kansas City, KS - Shawnee-Mill Valley HS, Mar Vidal from Barcelona, Spain and Aufa Putri Rachmadya from Jakarta, Indonesia will join the Shocker women's golf team as freshmen next fall. Laine Evans averaged 75.9 per round over 30 rounds as a junior last year but this Fall she has improved nicely on that with a 73.5 stroke average in 12 rounds. Gavrilla averaged 77.3 over 12 rounds as a junior but that only inlcuded 1 tournament in the Spring. She has also improved a lot so far this year averaging 73.7 over 12 rounds this Fall. Hopefully, both can continue that good play this coming Spring. Jr. Michelle Ledermann averaged 77.3 strokes over 30 rounds as a sophomomore and has improved to a 75.7 stroked average in 12 rounds this fall. Fr. 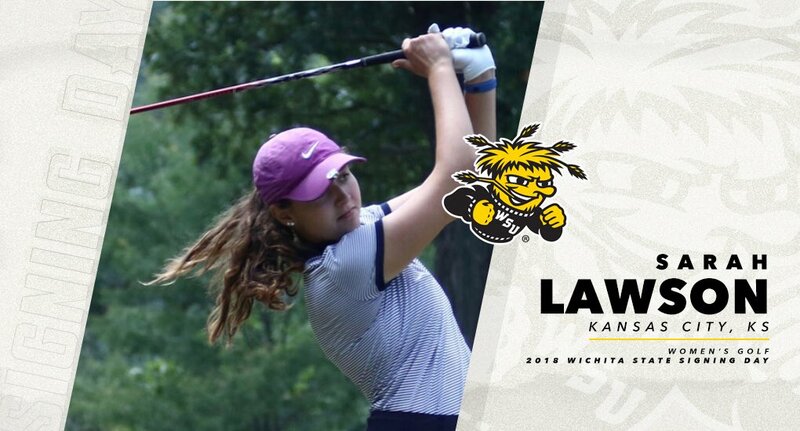 Hana Mirnik has her Shocker career off to a good start averagng 75.3 strokes in 12 rounds this Fall. Those 4 players pretty much carried the scoring load tor the Shockers.with the 5 slot filled by Jr. Anna Chickering who averaged 78.75 strokes over 12 rounds this Fall or Freshman Chiarra Arya (Gavrilla's sister) who averaged 78.8 over six rounds this Fall. It would appear that their could be opportunites for the newcomers to compete for spots in the Top 5 lineup. McCurdy on Sarah Lawson: "I'm so excited about Sarah joining the Shocker Golf program. Her game has improved dramatically in the past year and her high school career culminated with an individual second place showing at state while leading her team to a state championship win. She is very intelligent and coachable; a fantastic team player and Sarah is a golfer that we are going to be looking to for the Shockers to make a big jump up in the American." McCurdy on Mar Vidal: "Mar is a very solid golfer. Her fundamentals are sound and she has a high ceiling. Although she has good international experience, I think that her best is yet to come. Her attitude and demeanor are ideal for continued development as an athlete and she is going to be a consistent contributor for the Shockers." McCurdy on Aufa Putri Rachmadya: "Aufa is such a good all-around golfer. She is the type of golfer that will put consistent numbers on the board and with her great attitude, she's also the type of player that will make others around her better. Always smiling, always positive, always giving her best. Those are Aufa's strengths and Shocker Golf just got a whole lot better with her signing." Welcome to Shocker Nation Ladies! Best of luck to you all. The Shocks closed out regular season play with a 3rd place finish at the KC Intercollegiate. Not sure this tournament is a real good measuring stick as it was kind of a MVC-Summit League challenge plus WSU and Creighton ( who isn't very good). The Shocks had pretty good round in the 1st round and the 3rd round but a bad 2nd round on Monday afternoon hurt them. The two seniors, Laine Evans and Gavrilla Aray played pretty well and Anna Chickering, who has the highest stroke average had the best tournament of her career. Freshman Hana Mirnik who is right there with the 2 seniors in stroke average this season did not have a strong tournament. Nor did Freshman Chiara Arya in the #5 slot. Junior Michelle Lederman who is 4th on the team in stroke average this season did not play in this tournament. We will have to wait and see what the lineup for the upcoming AAC Championships on Sunday, Monday and Tuesday. I think a reasonable target for this Shocker team would be to match last season 5th place finish in the AAC Tournament (which has 10 teams as UConn and Temple do not sponsor Women's golf). To do this they need at least 4 players to play 3 consistent rounds. I'm just not sure if they have the team depth they need but we'll see how it goes. Hopefully, Anna Chickering's play this weekend is a good sign and not just an outlier. I have more confidence in Michelle Lederman than in Chiara Arya but I don't know for sure if Michelle is healthy. Nice article by Sully on the Shocker women's 2 senior golfers and team leaders. After Round 1 of the 2019 AAC Women's Golf Championship the Shockers, who finished 5th last year, are sitting in 8th place. However, there 14-over 302 is the same score they shot last year on this same course in Round 1. Last year the Shocks ballooned to a 316 in Round 2. Hopefully, they will avoid a similar fate this year. Defending Champion Houston leads the field at 1-under 287. Outside of Houston the field is relatively tightly packed after 1 round so there could be a lot of movement in Round 2. Shocker Senior Gavrilla Arya shot an even par 72 to lead the Shocks and is tied for 6th place individually after Round 1.